Week 31 of the PBP. Basil: the king’s herb. I believe this to be the tastiest weed on this good green earth. So many different flavors, so many colors, I could go on and on. With just a little pinch back at the beginning of the season, you’ll soon have a wealth of materials for pesto, thai cooking, even sorbet! I associate basil with Earth and Jupiter, not least because it has the reputation of being quite handy in money spells. I also find it to be a mood brightener. It’s almost impossible to feel sorry for oneself when munching on a tomato salad garnished with basil greens. 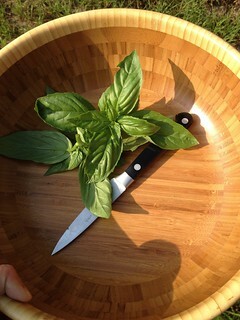 Basil is everything that is good in life, summer’s bounty and the promise endless fragrant breezes ahead.